Fluency is a bit like happiness: everybody wants it, but it’s not so obvious what it is or how to get it. In any case, it’s definitely one of the top goals for most Wall Street English students. So the WSE Research team decided to carry out an investigation into fluency, specifically exploring the role that teachers have in helping our students become more fluent. What sort of fluency levels are WSE students achieving? Do teachers think that fluency scores are useful for students? Are teachers confident in the fluency scores they give to students? Are teachers taking into account the expected level of fluency for learner, given the level of the learner, when giving fluency scores? All WSE learners, from beginner through to advanced level, take an Encounter class at the end of each unit of online multimedia study. First we analysed a huge number (10,700 scores on average per level) of fluency scores across all 80 Encounters to see what patterns we could find. And then we carried out a questionnaire for Encounter teachers in Italy and China, to find out what they thought about these questions, and how they thought students could improve their fluency. Here is a brief summary of what we discovered. 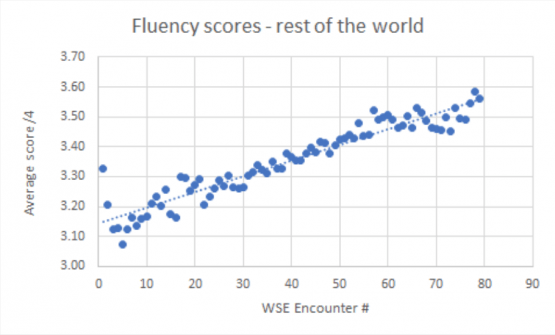 Looking at the analysis of Encounter fluency scores, students’ fluency levels are pretty good across WSE (3.16 / 4, or 79%), although fluency scores do increase as students go up through the levels: from around 3 (75%) for our beginners in our Survival level, to over 3.3 (83%) in our Mastery courses. This suggests that teachers tend to give our students fluency scores which are absolute, rather than scores which tell our students how fluent they are compared to the expected benchmark for their current level. Teachers definitely think the fluency scores are useful and helpful for students: 87% of them agreed. 93% of teachers thought they were fully able to assess fluency in their students. This is encouraging, although our analysis of the fluency scores data suggests that we need to help teachers to give students a grade which takes into account their level. 84% of teachers thought that fluency and accuracy were different (i.e. that someone can be accurate and not fluent, or fluent and not accurate). We then asked: Does fluency increase with ability? (In other words, are advanced students are naturally more fluent than beginners?) Only 10% of teachers disagreed with this. This maybe helps to explain why fluency scores go up with levels, as we saw above. Just to check, we also asked teachers: Do you ever give high fluency scores to lower-level students? 19% of teachers said that they never did – which is similar to the 16% who thought that fluency and accuracy were closely related (point 3). In teacher training, we need to help especially new teachers to understand what to expect from students at different levels in terms of fluency. This will help students to get a more accurate picture of their progress towards their fluency goals. We will see how we can improve the instructions for teachers to make it easier for them to assess students’ fluency. We will continue to improve the tools we give to teachers so that they can give students relevant and personalised advice about how to improve their fluency. Simon Buckland has had a life-long involvement with technology-assisted language learning as a developer, author and curriculum specialist. For many years Simon worked for Wall Street English, first as chief course author, and later as Academic Director, where he piloted a major large-scale quantitative project measuring learning and aligning the course to the Common European Framework. From 2010 to 2017 he worked for Pearson English as the curriculum specialist on the Global Scale of English team, where he developed the GSE Grammar Learning Objectives. Simon was educated at OxfordUniversity, where he took a B.A. in English, and at Sussex University, where he took an MSc in Artificial Intelligence, specialising in Intelligent Computer-Aided Learning.